Fiddly little things, but well worth the effort if you have the time. I made these for an end of term dinner party I hosted recently. My first proper fully vegan dinner party, now that I think about it. Not a drop of meat or dairy to appease my non-veggie guests ;) The last time I cooked for a significant number of people, I caved at the last minute and gingerly put a chicken dish together. I tend to have pretty good instincts when it comes to flavouring/seasoning, but with no way of tasting the thing myself, goodness knows what they had to endure. At least there was no gagging... which is always a good sign. So yes, it was a blissful experience putting the food together this time around... maxing out on flavours and techniques using all my plant-based ingredients. There were about four other dishes on my selected menu including a spicy red vegetable curry, fried rice and a couple of intricate salads. A friend had agreed to handle dessert - a simple, healthy fruit salad to balance the heavy main course. 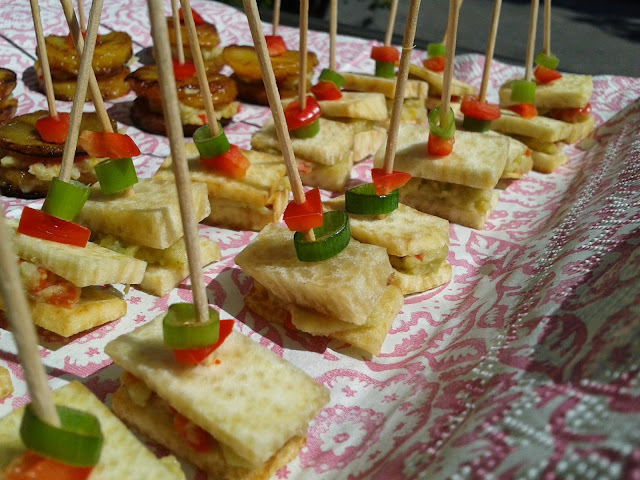 These yam canapés easily took the longest time to make and were an accidental addition to the menu. 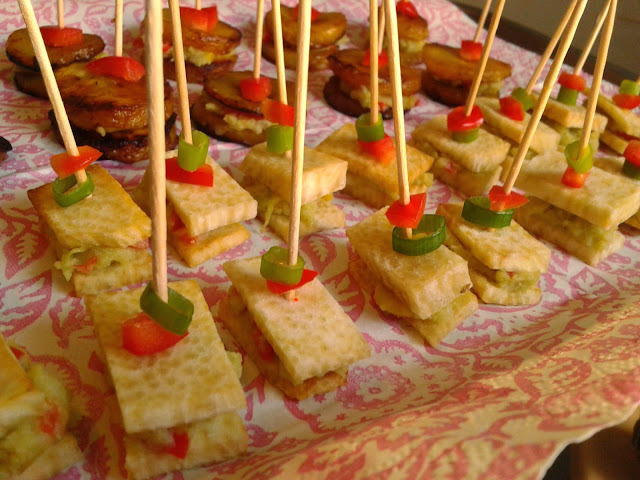 I was all set on making just the plantain canapés (which you can sorta make out in the background of the picture below) but realised that I had only one plantain left at home and no time to go out and buy some more. They looked a bit sad on the tray and so these mini yam taste explosions were born. The filling was also an experiment using the ingredients I had lying around. If you've ever had fried yam then you know just how amazing it tastes on its own. But with the creamy avocado-pepper-potato filling...? Pure magic. It is absolutely important that the yam is thinly sliced or else the canapés will go from bite-sized treats to full on bricks that are awkward to eat. Just to warn you. Trim around each round slice of yam to form a roughly square shape. Then cut into four equal parts. Lay them out on some snazzy tray to serve.